Ok - I admit it - I love Doritos - especially cheese flavored Doritos. I know they don't exactly fall into the category of health food - but I could eat a bag a day no problem. There's a trick to getting Doritos here though (here in Bangkok). 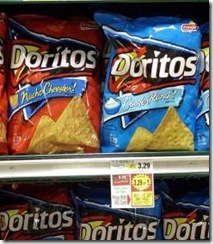 Local supermarkets do sell Doritos - but they seem to come in batches - and then disappear for a few weeks. So... I buy a LOT of them when they're here - enough to last until the next wave arrive. I was sort of hopping that some clever stock or inventory management system of the bigger supermarkets would have figured this out - and order more Doritos (ala Walmart), but it hasn't worked, and I'm sure when I hit the Dorito jackpot - there are a lot of unhappy Dorrito lovers here trying to work out where all the Doritos have gone. I love Doritos too lol, especially the cool ranch and nacho cheese flavor. Haven't had any of those in a long time.